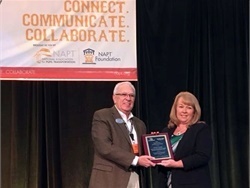 Steve Barker, sales manager for AMF-Bruns (shown left), presented the first AMF-Bruns National Special-Needs School Bus Driver Of The Year Award to Tammy Cummings, a bus driver and safety trainer for Greenville County (S.C.) Schools. 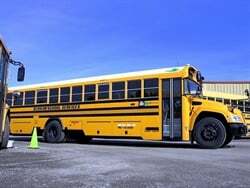 HUDSON, Ohio — Securement supplier AMF-Bruns of America presented its first award to a special-needs school bus driver on Wednesday. 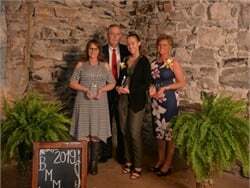 Tammy Cummings, a bus driver and safety trainer for Greenville County (S.C.) Schools, was named the winner of the AMF-Bruns National Special-Needs School Bus Driver Of The Year Award. Cummings, who also has a special-needs child, was transporting four special-needs students in March when a tractor-trailer crossed into the lane of the bus and spun out of control, hitting her school bus. Cummings stayed calm and stopped the bus to lessen the force of the collision. 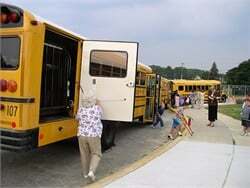 She had the presence of mind to keep the students in the bus to avoid downed power lines. 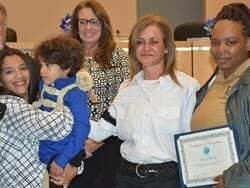 Cummings was recognized for this achievement and received her award this week at a special ceremony held at her school district. The securement supplier received a tremendous response from candidates across North America. 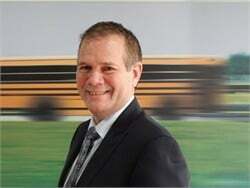 Nominations for the annual AMF-Bruns National Special-Needs School Bus Driver Of The Year Award will be accepted after Jan. 1.For more information, including criteria and the application deadline, go here.